A day after the Philadelphia 76ers clinched the team’s first playoff appearance since 2012, and 154 days since he last appeared in a game, Markelle Fultz, the No. 1 pick in last year’s draft, was back on the court Monday night. And this time around, he looked like the difference-maker nearly everyone once thought he would be. 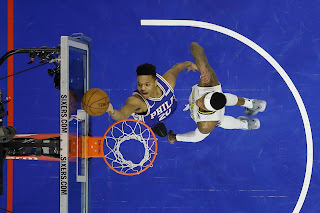 Before the game against the Denver Nuggets, Coach Brett Brown announced to reporters that Fultz would be active for the game and that it had been the player’s decision to come back. Fultz made his entrance with 2 minutes 54 seconds remaining in the first quarter to thunderous applause at Wells Fargo Center in Philadelphia and chants of “Fultz” — which he later said confused him, as he thought they were chanting for Nick Foles, the quarterback who recently led the Philadelphia Eagles to a win in Super Bowl LII. After turning the ball over on his first trip up the court, Fultz settled down and scored his first points since October on an easy layup. It was not all pretty in the first half, as Fultz, who had struggled mightily with his jump shot back in October, came up well short of the rim on an 11-footer that represented his only outside shot of the half. His movement was fluid, without the jerkiness that had plagued him earlier in the season, but the result was the same. The difference on Monday was that Fultz, who has battled confidence issues, fought through the struggle. He looked confident running the point and showed a flair for finishing at the rim. And he finally got the jump-shot monkey off his back when he connected on a 14-footer with 2:13 left in the game, prompting fans and players to leap to their feet in support of the 19-year-old. Less than a minute later he added a 20-footer, the longest make of his short N.B.A. career. In all, Fultz played 14 minutes in Philadelphia’s 123-104 victory. He shot 5 for 13 from the field and finished with 10 points, 8 assists and 4 rebounds. 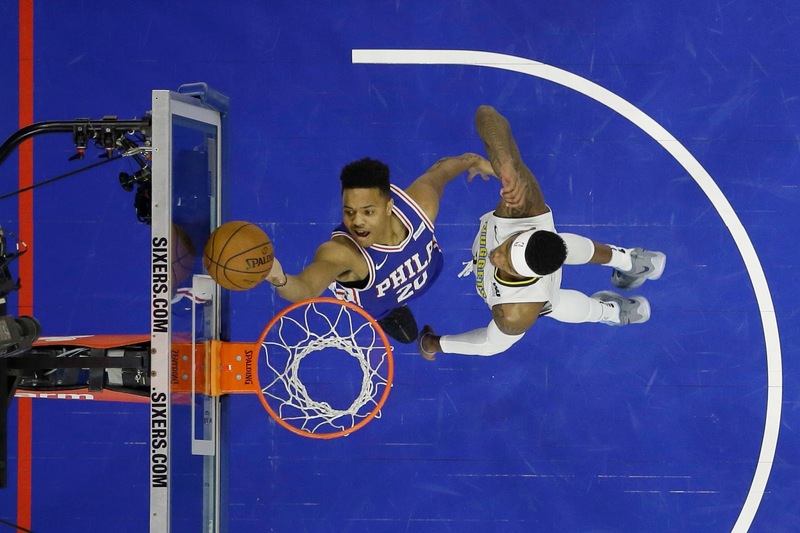 Most important, the 76ers outscored the Nuggets by 16 points when Fultz was on the court. While he did not seem eager to discuss his injury history or his confidence problems after the game, Fultz showed a sense of humor when asked how he thought the game went. For Fultz to once again look like a player worthy of his draft status was a revelation for the 76ers, who made quite a splash last June when they surrendered first-round picks in 2017 and 2018 to the Boston Celtics in order to obtain the top pick in 2017 and the right to select Fultz. The move to get Fultz, considered the best player in his draft class, was supposed to be the finishing piece of a team-building puzzle that had come to be known as The Process during Sam Hinkie’s years as the team’s general manager. The Process has come to fruition, with Philadelphia’s former lottery picks, Joel Embiid (drafted in 2014) and Ben Simmons (2016), being far and away the best players for a team that has improved from 10-72 just two seasons ago to being 43-30 after Monday’s game. But the improvement has come without any help from Fultz. Fultz was a fantastic shooter in his lone collegiate season at Washington, connecting on 41.3 percent of his 3-point attempts, but he had a brutal start to his rookie season for the 76ers, turning in completely ineffective performances in his first four games. He did not even attempt a 3-pointer — none of his shots were from even 16 feet away from the basket — and he averaged just 6 points a game. He was then sidelined with what the team called a scapular imbalance in his shoulder. Online debates ran wild over whether Fultz was dealing with a shoulder injury or a case of the yips, with several videos surfacing of Fultz badly missing jumpers in the gym while trying to regain his form. Before Monday’s game, 76ers General Manager Bryan Colangelo said that Fultz had been cleared medically for some time and that it had been up to him as to when he would try to get back on the court. “It’s about him being comfortable and him being in the right situation to be in a position to help us and help his teammates out there,” Colangelo said. With nine games remaining in the regular season, the 76ers will be trying to evaluate if Fultz can help the team during its long-anticipated playoff run. If Monday was any indication, they have added an impact player. 0 Response to "Markelle Fultz Returns for the 76ers, and He Brought His Jumper"